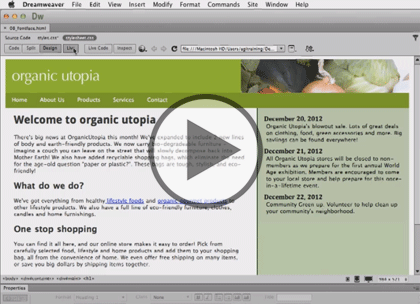 Dreamweaver CC is packed with the tools you need to create dynamic and interactive sites online. In this ten part learning series, you can learn the ins and outs of maximizing Dreamweaver CC – from navigating the interface to working with HTML, CSS, jQuery, and more. Get to know HTML and how it can be used to set up your own customized website. Add text and images, create page layouts, work with web fonts and tables, and fine tune your workflow for maximum efficiency Gain expert knowledge on site design, including designing for mobile devices and utilizing the jQuery UI library Incorporate multimedia like video, audio, interactive content, HTML forms, and other tools into your web development projects. This course assumes very little familiarity with Dreamweaver CC. This course is part of 10 courses, Dreamweaver CC: Workspace, New Site and Page; Dreamweaver CC: Text and Images; Dreamweaver CC: External and Text Styles; Dreamweaver CC: Divs and Page Layout; Dreamweaver CC: Navigation and Transitions; Dreamweaver CC: Using Tables; Dreamweaver CC: Video & Templates; Dreamweaver CC: Forms; Dreamweaver CC: JQuery and Dreamweaver CC: Fluid Grids & Publishing. Please be sure to view the courses in order if you are new to the material.